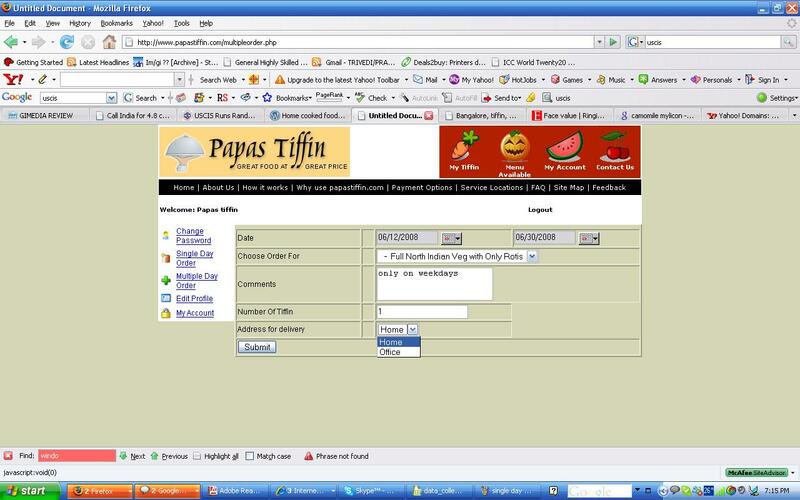 Papastiffin brought online tiffin ordering to Bangalore. We thought that it will be appropriate for the “Silicon Valley of India” to have an online version of tiffin ordering. Our customers can register on our website and then can order / cancel food online. 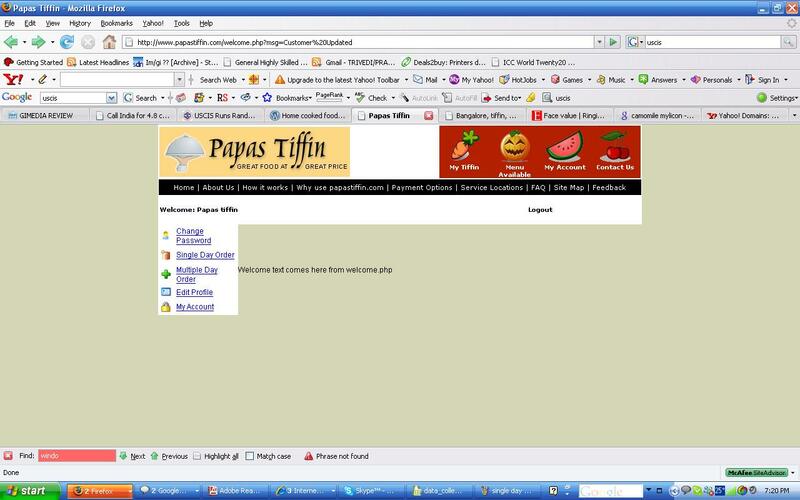 We encourage all our customers to register on Papastiffin even if you do not put orders online. It helps us to communicate with our customers. You can also call at 9480493872 to put your orders. Registration : It is easy. Please visit papastiffin and click on “new user”, you will be directed to the registration page. 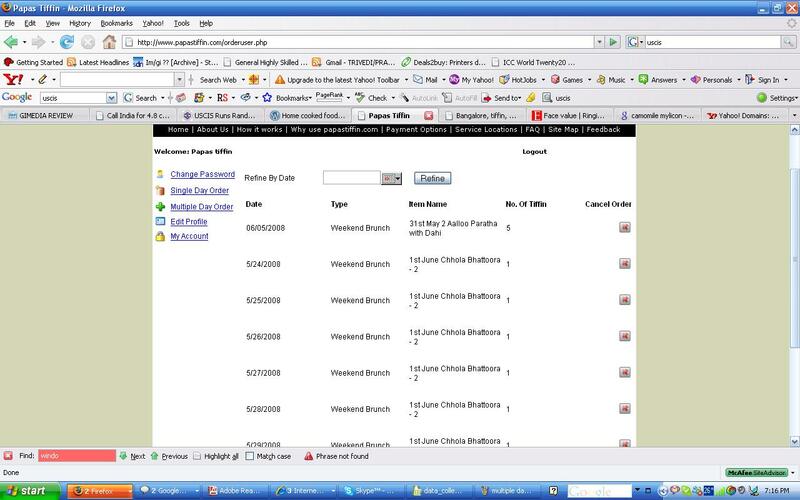 Customer has to choose date, menu, # of tiffins, location of delivery (home / office : needed at the time of registration). Customer can also put the comments in the space provided. Customers can choose beginning date & end date, menu item, number of tiffins and place of delivery. Comment section could be used to put things such that (“please do not deliver on weekends” or “please deliver at office on weekdays and home on weekends). Customer sees the “Cancel Order” at the right hand side. There are red signs [X] in front of each date. Customer can click on this red sign [X] to cancel the order. One should not try to delete orders that have been delivered or will be delivered on the same day or next day. Papastiffin delivers tiffins to homes and corporates in Koramangala, Indira Nagar and NGV. We supply tasty, hygienic, home cooked food to our customers. We try to do our best to provide you best service but are always looking for feedback and suggestions.